The Chintamani Temple of Theur (Theyoor) is a Hindu temple dedicated to the Lord 'Ganesha (Chintamani Ganpati Theur)' Son of Lord Siva and Parvati. 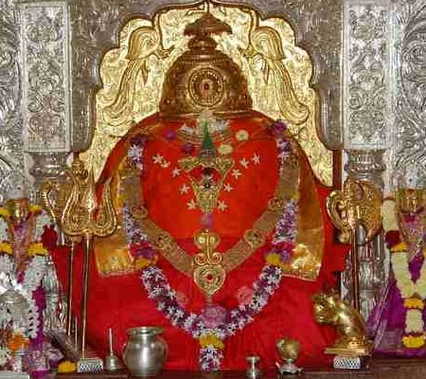 This temple is one of the popular among the Ashtavinayaka temples and 27.04 km from Pune district in Maharashtra. Theur is located in the Haveli Taluka of Pune district and near the confluence of river Bhima and the conjoint river Mula and Mutha. 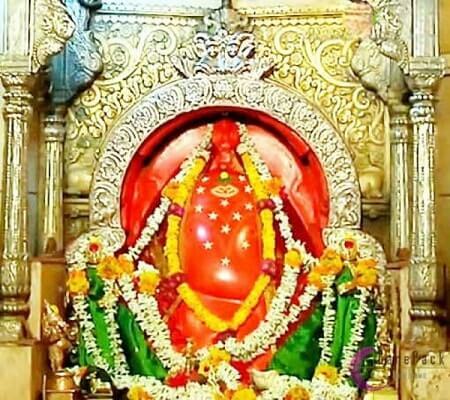 Theur is prescribed to the fifth temple to be visited in the Ashtavinayak Darshan tour or yatra, people often visit Theur second in the place after Morgaon, as it is a more convenient route. The idol of the deity is self-emanated (swayambhu murti) and is east facing called purvabhimukha, with his trunk turned left and beautiful diamonds studded in his eyes. The idol is in a cross-legged seated position. Theur itself is an important mythological place located at the confluence of three major regional rivers i.e. Bhima, Mula and Mutha. Lord Ganesha as Chintamani Ganesha is God who brings peace of mind and drives away all perplexities of the mind. 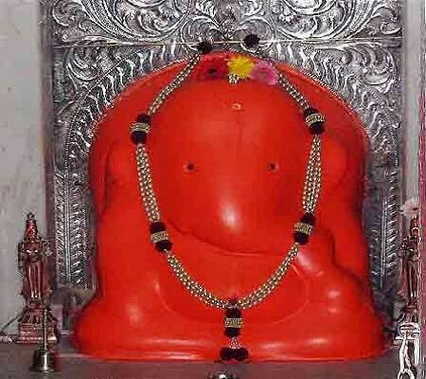 Chintamani Ganpati Theur temple is one of the popular among the Ashtavinayaka temples and 27.04 km from Pune district in Maharashtra. Theur is located in the Haveli Taluka of Pune district and near the confluence of river Bhima and the conjoint river Mula and Mutha. The significance of Chintamani Ganpati Mandir is that Lord Chintamani is the god who brings peace mind. The idol of Lord Chintamani Ganesha faces east. The Lord Ganesha eyes are precious gems. The Mahadwar or the main gate of the temple is north-facing, and a road connects it to river Mula and Muth. Spend 1-2 hours for Ganesha darshan and temple views. On weekends the rush will be more. During Ganesh Chaturthi, Ganesh Jayati and other Ganesh festivals you will spend 4-5 hours for Chintamani Ganpati darshan. At Sunday, they also serve lunch after 12 PM, at a very minimal rate of Rs 15.I highly recommend going for that lunch. The temple celebrates three main events and festivals. The Ganesha Prakatostav which corresponds to the Ganesh Chaturthi festival. The festival is celebrated from the first to the seventh day of the Hindu month of Bhadrapada(Bhadrapat), where Ganesh Chaturthi is the fourth day. A fair is held at this event. The Maghotsav event is held to commemorate the birthday of Lord Ganesha - Ganesha Jayanti, which falls on the fourth day of the Hindu month of Magha. The temple event is celebrated from the first to the eighth of the month. A fair is also organized. The Rama-Madhav Punyostav on the eighth day of the Kartik month commemorates the death anniversary of the temple's best-known patron, Madhavrao and his wife Ramabai, who performed Sati on his funeral pyre and was burnt with him.In the events or Ganesh Jayati days, lots of shops here for shopping and the Sweet Prashad (Pedha) of Ganesha. The current temple was built by the 'Ganapatya saint Morya Gosavi' or his 'descendant Dharmadhar' (Dharanidhar). Morya Gosavi often visited the temple on his trips between his hometown Chinchwad and Morgaon, the foremost of the Ashtavinayaka temples. On every fourth lunar day after the full moon, Morya used to visit the Theur temple. Now, the temple is under the administration of the 'Chinchwad Devasthan Trust', which also governs Morgaon and Siddhatek Ashtavinayak temples. The temple has a wooden Sabha-mandapa, which was built by Madhavraoji. The hall also has a black stone water fountain in it. Besides the central shrine dedicated to Lord Ganesha/Ganpati, there are a number of smaller shrines in the temple complex: Mahadeva (Lord Shiva) temple, Lord Vishnu-Lakshmi temple, Lord Hanumanji temple etc. Behind the temple is the Peshwa Wada – the Peshwa Palace. Theur is nearly 27.04 km from Pune. Several state-run buses, cars operate from Pune and Mumbai to Theur. This Temple is located at a distance of 15 km from Hadapsar. The nearest airport is at Pune, which connects to all major Indian cities. For Devotees, Chinchwad Deosthan trust has provided accommodation facility (Bhakta Niwas) at Theur. Bhakta Niwas is well equipped with 9 double rooms with attached toilets. You can contact the trust office for booking. You can make the booking on phone or postal communication. Theur to Ozar Distance:2 hr 42 min (89.9 km) via NH60 Highway. Fastest route, the usual traffic. This route has tolls. Theur to Ranjangaon Distance: 56 min (41.5 km) via Aurangabad - Ahmednagar - Pune Highway/Beed - Ahmednagar - Pune Road/Kopargaon - Shirdi - Ahmednagar - Pune Highway/Parner - Pune Highway/Pune - Ahmednagar Highway. Fastest route, the usual traffic. This route has tolls. Theur to Lenyadri Distance: 2 hr 53 min (98.2 km) via NH60 Highway. Fastest route, the usual traffic. This route has tolls. Theur to Siddhatek Distance: 1 hr 40 min (82.1 km) via NH65 Highway. Fastest route, the usual traffic. This route has tolls. Theur to Morgaon Distance: 1 hr 9 min (62.5 km) via NH65 Highway and Shirur - Satara Road. Fastest route, the usual traffic. This route has tolls. Theur to Pali Distance: 3 hr 13 min (149 km) via Bengaluru - Mumbai Highway/Mumbai - Pune Highway/Mumbai - Pune Expressway. Fastest route, the usual traffic. This route has tolls. Theur to Mahad Distance: 2 hr 16 min (114 km) via Bengaluru - Mumbai Highway/Mumbai - Pune Highway/Mumbai - Pune Expressway. Fastest route, the usual traffic. This route has tolls. The Vighnahar Ganpati Temple or also known as Vigneshwara Temple of Ozar (Ojhar/Ojzar) is a Hindu temple dedicated to the Lord Ganesha (Ganpati Bappa) Son of Lord Shiva and Parvati. The temple celebrates the usual festivals associated with Ganesha. Shri Mayureshwar Ganpati temple or Shri Moreshwar Ganpati temple is a Hindu temple dedicated to Lord Ganesha. It is located in Morgaon in Pune District. 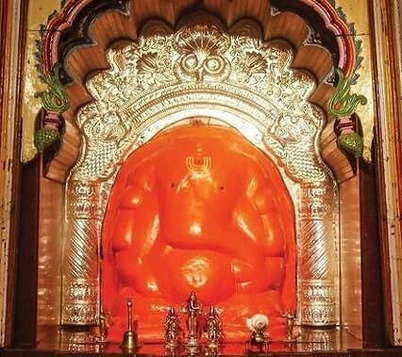 The temple is one of the Ashtavinayaka, the eight revered shrines of Ganesha in the Maharashtra.